We went to Geneva, Switzerland today. We took a train at 8:30 a.m. and were in Geneva by 10:30 a.m. Such a quick nap to such a wonderful destination! Once we got there we had to exchange our euros for Swiss Franks. OK, I’m not going to lie, that was pretty effing annoying. The Frank is apparently comparable to the American dollar, except everything in Switzerland was overpriced! Sorry, no, I am not paying $8 for a cupcake. I’ll give you a real life example: Leighann wanted a Swatch and it costs 90 Franks in Geneva but then she ended up getting it for 67€. I’d say she got a decent deal – even with the exchange rate. Which reminds me…I owe Chelsea $9. I’ll just buy her a pitcher at Conor’s when we both get back to Boston. Anyway, after finally figuring out our money situation, we decided to check out the United Nations. The people at the visitor’s center told us not to walk there, so naturally we did. It was a pretty far walk, but not altogether unpleasant. We walked along the lake and got a feel for the city. Then we arrived. Flags of all the countries lined the entrance. We got in, paid our money and went on our tour. It was so phenomenal to stand in the rooms that the leaders of our world discuss treaties and war in. Just imagine being that powerful. In one room, there were two separate entrance doors. At first, no one really understood this. But the reason for it is that when two countries are at war and must discuss conflict resolution, they enter and exit at the same time (rather that one entering before the other) so that neither person (or country) shows dominance. Then we went for the most amazing fondue. 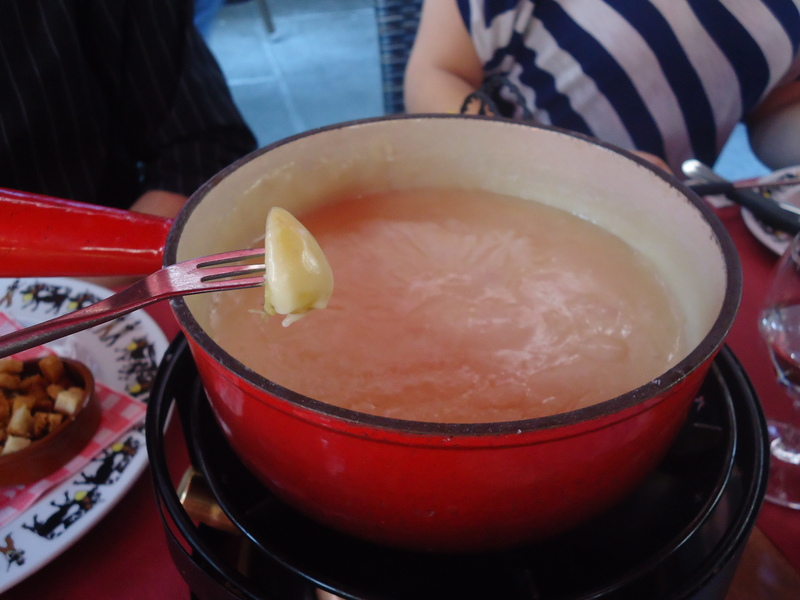 We shared a huge pot of bacon flavored cheese fondue with ham (they think that bacon = ham here) chunks in it. It was really delicious but I don’t think I want to look at cheese for a while again. After that we did some shopping and exploring and then, after blinking an eye, our day in Geneva was over. Such a beautiful city.